At the River Valley Pace a wonderfully nice lady came riding up to us as we were playing around in the field. She asked if we wanted her to take a pic and snapped one with her cell phone. She emailed this to me and I love it. 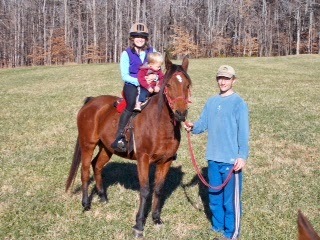 It is a little blurry and Wyatt isn't looking at the camera, but it captures our new shenanigans well: Me holding Wyatt on a not so sure Gemmie while Dusty holds the reins and runs around. I really hope Wyatt continues to love to ride and once he is big enough he will be getting himself a nice little horse of his own. I'm thinking of a 14.2h Arab or something of the sort around 20+ years of age with enough world experience to not be a freak (like Gem) but with enough health left to carry him on his first Pace and LD same day. I don't want a pony because I have no intentions of ever riding one and whatever horse Wyatt gets will be getting conditioning and tune ups by yours truly (for what it is worth anyway). If Wyatt decides he hates to ride, well then we will just find something that he does like and hopefully he will still enjoy camping enough to come along with me to endurance rides.